As I have indicated in the recent past, energy stocks are well worth considering as investment opportunities. Coal stocks, in particular, have declined following an uncharacteristically warm winter in the United States. However, as coal demand increases in emerging markets such as China, India, and Africa — where it remains a cheaper energy source than natural gas — the commodity seems poised to make significant gains in the months ahead. 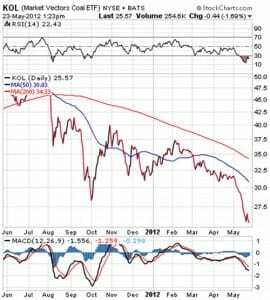 I am tracking one coal fund in particular, the Market Vectors Coal Index (KOL). KOL is down 23%, year-to-date, which means that now could be an opportune time to enter the position. After beginning the year at $34.07, the exchange-traded fund (ETF) continued to fall steadily to $26.01, as of May 22. Here is a brief description of the fund. Established in January 2008, the Market Vectors Coal ETF (KOL) seeks to replicate as closely as possible, before fees and expenses, the price and yield performance of the Stowe Coal Index (TCOAL). TCOAL gives investors a way to track the overall performance of coal industry companies. The fund also provides exposure to emerging markets such as China, India and Africa. The ETF is widely invested in the coal industry on a global scale, with holdings in the United States (41.6%), China (23.5%), Indonesia (16.0%), Australia (8.5%) and South Africa (4.7%). As such, the fund is poised to capitalize on the increasing global demand for coal in the coming months. Because of its geographic diversity, the fund also offers some stability in a historically volatile sector. If you are like me, you’ll take as much stability as you can find in these uncertain economic times. The fund’s top five holdings, as of April 30, are China Shenhua Energy Co. Ltd. (1088 HK), 8.49%; Consol Energy Inc. (CNX), 8.46%; Peabody Energy Corp. (BTU), 8.37%; China Coal Energy Co. Ltd. ( 1898 HK), 8.01%; and Joy Global Inc (JOY), 7.47%. Even though many of these stocks are down, year-to-date, they stand to rise significantly in the coming months, with an unseasonably warm winter in the United States behind us. In addition, KOL currently is trading at a significant discount to its net asset value (NAV), which makes the fund even more attractive for investors. If demand for coal increases as expected, KOL has the potential to notch significant gains in the months ahead. Due for a Bullish Bounce? It was another down week in global markets this past week. The Dow Jones Industrial Average dropped 1.02%, the S&P 500 fell back 1.05%, and the tech heavy NASDAQ tumbled 1.89%. Emerging markets continued to pull back, as well, with the MSCI Emerging Markets Index down 2.43%. The good news is that markets have steadied over the past two days -- although European markets are once again selling off sharply on this morning's trading.